Having just emerged from a difficult couple of years, my art can not help but be colored by my questions, struggles, and realizations. This emotional ebb and flow is naturally worked out through my creative process. The more I mature as a person and an artist, Im realizing just how sacred these seasons are. No, I don’t by any stretch worship any melancholic artistic nature, nor depend on it to feed inspiration for my work. It is something different, more like honest dialogue in the struggle to remain faithful, humble and grounded as a person and as an artist. 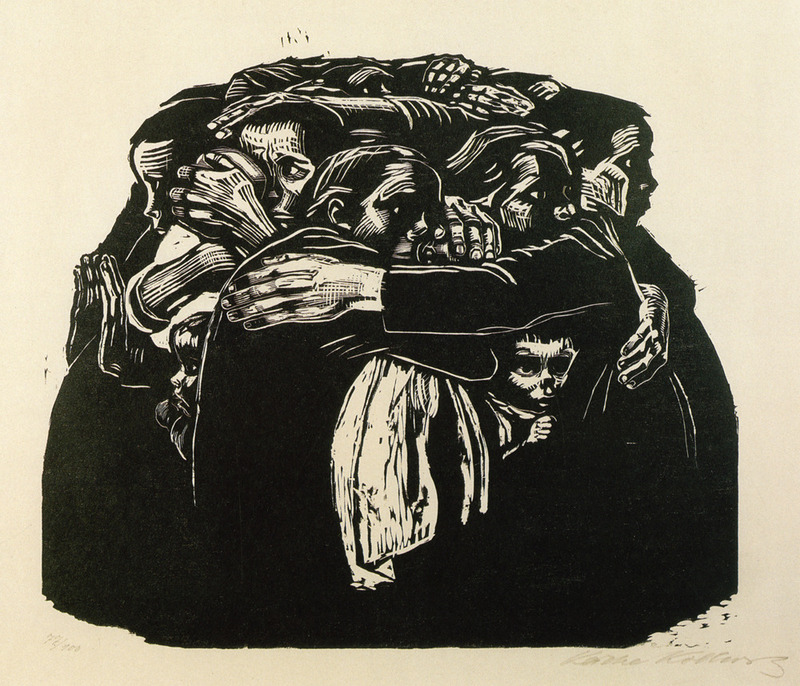 One of my favorite artists has always been Kathe Kollwitz (1867-1945). Her work moved me even before I was a mother and able to identify with some of her subject matter. I find her art full of devotion, conviction and substance, demanding nothing less than a response from the very depths of me. I get a lump in my throat, a watering in my eyes and a burning in my gut. I feel uncomfortable, because the grief she portrays seems so intimate and private. Yet, through her art, she gives us permission to enter into the grief she and her community experienced and remains frozen in time. She not only conveyed her own individual grief, but also the physical and emotional poverty of the community in which she was living. She seems to give a kind of honor and dignity to humanity while simultaneously attributing a value to grief….treating it, in a way, as sacred. What does it look like to be an advocate of those in grief? What does it look like to be an advocate of myself in grief? In my opinion, her work is able to communicate emotion in a way many artists never achieve. She seemed to be no stranger to suffering herself. She wasn’t just commenting on it from a distance. She made art from what she knew already. She wasn’t objective about it, she was living IN it. She was grieving herself while simultaneously being an advocate for others. How is that possible, to grieve and yet not be self-consumed? Where did she draw this emotional strength from to be able to carry not only her own sorrow but also that of those in her community? While many would make the immediate judgement that her work is dark and hopeless, or writing it off as being too socially and politically charged, I feel the opposite. Her work beckons me to lean in, look and listen. She left a visual legacy of personal devotion to her community. This strength to portray grief in all of its depth, speaks a mysterious beautiful hope to me, a kind of soul-depth perspective that says there is more to our existence then the sufferings we encounter in this world. 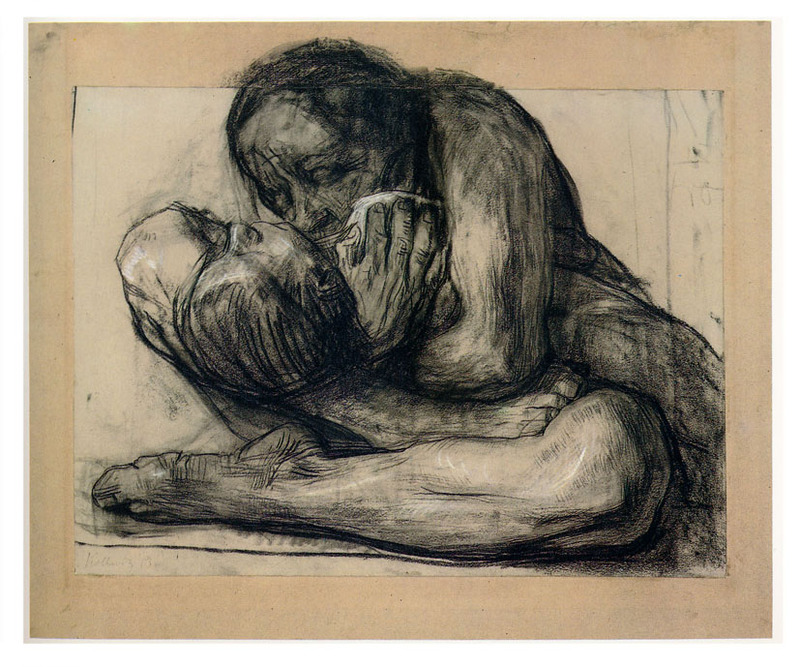 I consider Kollwitz’s art as an honest reflection of life experience. I’m inspired by her fearlessness to bring her life struggles and raw emotions into her work. Her art was unapologetically struggled-filled, yet still managed to carry such beauty. I feel nowhere near her caliber as an artist or even an advocate, but her example challenges me to create art that is honest and transparent, while also reflecting the virtues I hold so dear; faith, hope, and love. Yes indeed, Deb, and a big theme in my life. you make me stop and think. i appreciate this blog. keep writing. Thanks, Jessica. I will try to keep up the challenge of writing. Your encouragement helps!